Welcome to Tangier’s Kasbah Hostel. 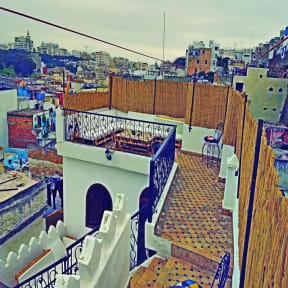 We are a traditional Moroccan house situated in the historic Kasbah of Tangier’s Medina. We are a house of backpackers, world travellers & wanderlust seekers. We offer mixed dorms & private rooms, lockers, clean bathrooms/ showers, a common Moroccan salon and a fully stocked kitchen/ BBQ spot on the terrace. We cook some amazingly yummy food and routinely invite our guests to join us. Also we offer Free Breakfast, Wi-Fi, a Book Exchange, and a double terrace overlooking the Kasbah, fishing port, old Medina, ‘Ville nouvelle’ and the Mediterranean. As a backpackers Hsotel, Tangier Kasbah Hostel welcome those coming to tangier from all over the world. We are a small, social and sincere home of international travellers who believe hostels are much more than a cheap place to stay. For us, it's about meeting fascinating people from all over the world, making lasting friendships, and creating community, this place is more than a hostel to us; it is our home. As we are in the business of getting to know people, we strive to learn about the interesting people who choose to book with us. We do a good job providing the amenities and services of the larger hostels, except with a personal touch. Our staffs are very friendly, polite, welcoming and knowledgeable, they speak: English, French, Spanish, Danish, Arabic, a bit of Italian and German. They'll make sure that you'll have a pleasant memorable experience in tangier. 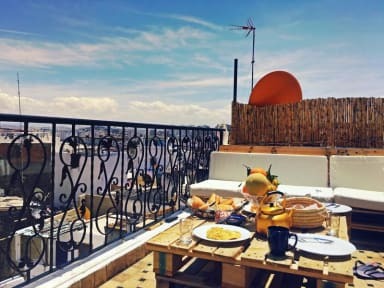 If you think this unique hostel is right up your alley, we invite you to come spend some time with us to discover and experience Tangier and Morocco from a whole new different perspective. Tangier and the Medina is chock full of things to do, of course. And, since we do a bit of traveling ourselves, we know budget is the key. We definitely will not push a bunch of expensive tours and tickets on you as other hostels around do. We are just happy to point you in the direction you seek- armed with a map or an offline navigation app and personal recommendations. .
Hercules Caves.. and many other amazing and fun things to do in this fascinating city. Standard 6 Bed Mixed Dorm, with Shared Bathrooms and showers. Standard 4 Bed Mixed Dorm, with a private shower and shared bathroom/shower. Standard Double Bed Room with shared bathroom and shower. Our location is ideal! We are located 2 minutes’ walk away from the Kasbah museum or Kasbah Square known as Garra D'Kasbah (Place du Mechoir) which is easily accessible by taxis. From there walk through the gate of BAB EL-ASSA then continue walking down the stairs on Rue Bab Assa, make a turn onto the first street to your right: Rue Sidi Khalil (on Google maps it is ‘Rue Sidi Jalil’), from there continue walking until you reach the first little alley on your left, we are house number 17 and you'll find us. If you’re having difficulties finding our location, contact us via email or phone. We will make sure to help you out in any way possible, or you can use Google maps = Search = Kasbah Hostel Tangier Rue Sidi Jalil and you’ll find us. 12 Hours Reception. But if you're Check-in early or you have any other requests, we would like to be informed before via an E-mail or a phone call. Have stayed here before and the hostel was up to its usual high standards. Comfortable beds. Efficient (and humorous) staff. Great view over the whole medina towards the sea. Guests from all over the world with plenty of good banter. All the staff were brilliant. Very friendly and helpful. Lovely room and facilities expectant of budget accomadation. Excellent location if you want to be in the heart of the medina. The staff are welcoming and helpful. The atmosphere is friendly with a homey vibe. The beds are comfy and they have hot water. Friendly staff and a cool location. Really really liked this hostel! Comfy beds, cool staff, nice breakfast, good location. I needed a few days to chill after a stressful time traveling in Morocco and this was just the right place. The roof terrace is epic! Nice place in a quiet back street nr the harbour. Good view from the roof terrace. Clean but quiet a lot of house keeping clutter left about the hallways. Great clean room.. great bed! This hostel was small and average, didn't really have an atmosphere to it. My bed had A LOT of bes bugs, unfortunately. So I had to sleep in the sofa in the terrace, which didn't turn out so bad because I woke up to a beautiful sunrise (LOL). I heard bed bugs are in almost all hostels in Morocco so I was just unlucky. Pros are that it's very near one of the ports so if you're taking a ferry, the location is good. Also, the staff are very friendly and helpful!! The hostel is up in the hill. You have to hike up and down if you want to go some where. Breakfast is simple. No egg.